accident | my heart is happiest when i travel. read. write. connect. If you’ve read my blog this month, then you know about the accident and saga that began two and a half weeks ago. Today was another appointment in a string of appointments. On the docket was cleaning my wounds, changing the dressings and a check-up with the doctor on my progress. Update: The road rash on my ankle is healing pretty well, and while it isn’t exactly pretty, the majority of my wound is now dry and they didn’t need to even cover all of it today. My toes are healing, but considering the open wounds are only a week old thanks to last week’s fiasco, they aren’t as far along as my ankle. That being said, only 3 toes needed to be covered today. So, progress. My ankle, foot, lower calf is still swollen, but is not nearly as swollen as it has been, so the doctor was pleased with that. I’ve got some range of motion, although my Achilles tendon is super tight, which is making it difficult to put my foot down normally. I’m soooo over the whole hobbling on crutches or using a wheelchair thing though. Teaching preschool in a wheelchair seriously cramps my style. I can’t get around easily, especially in a school that’s not totally handicap accessible (so many steps! ), and I’m just not the teacher I want to be right now. I can’t do what I want to do and that makes me cranky! I wake up every morning and think, I’ll just walk. I’ll be fine. Only I’m not fine. My leg doesn’t do what my brain tells it to do. Grrr! Anyway, the last few days, I’ve been able to put a little weight on my foot, and with the aide of my crutches, I’ve been able to walk-ish. Due to the fact that I can’t put on a shoe or anything, my practice has been confined to my apartment. Today, I asked the doctor if I could have some sort of foot covering to try and walk outside and at school. I demonstrate my willingness to try by hobbling around the treatment room. After a bit of cajoling, he agrees to let me try. He even recommended I see a doctor in the rehab department and start physiotherapy today! Physio went well. After a heat pack treatment for 30 minutes, I was put through a series of exercises, and to my surprise, most of them didn’t hurt at all. I then got to practice walking around with my new kicks! She kept telling me I was doing it wrong, but like I said, my leg’s not listening to my brain right now. At least I was doing it, even if it wasn’t exactly right! 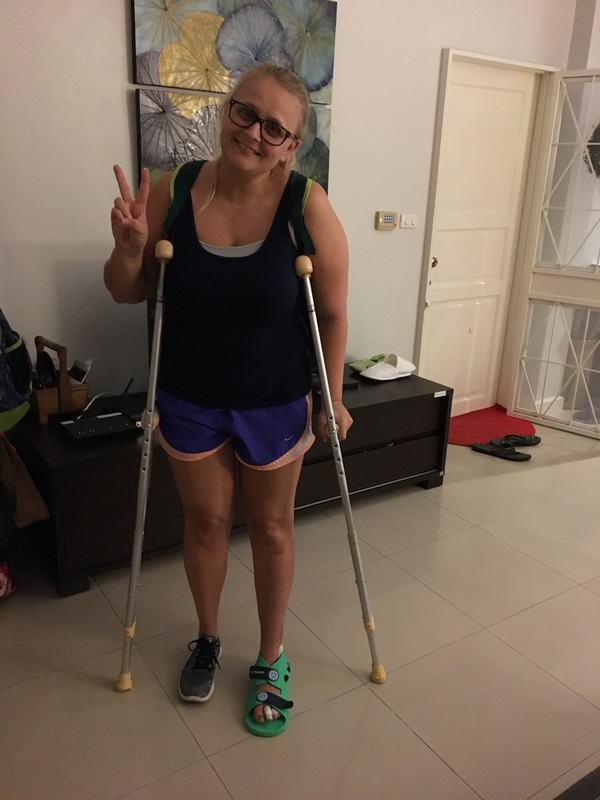 This entry was posted in Slice of Life and tagged #slice17, #slice2017, #sol17, accident, ankle, baby steps, crutches, improvements, learning to walk again, physiotherapy, Slice of Life, Slice of Life Challenge on March 22, 2017 by aggiekesler. 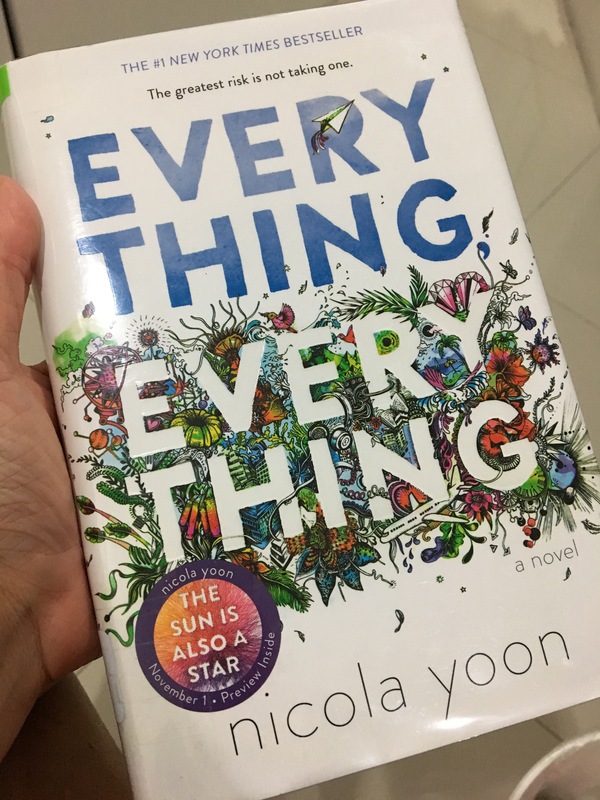 “You know, I didn’t cry the last time I had my wounds cleaned,” I bragged to Dr. Narong, my no-nonsense doctor who thinks crying is unnecessary. He undresses my wounds and begins his assessment. I’m now nine days post-accident. “Your arm is almost completely healed. I’ll just clean it, but we don’t need to wrap it anymore,” he tells me. One good report. Let’s hope there’s two more where that came from. Inspecting my largest wound, the gnarly road rash on my ankle, he reports, “Your ankle is healing well. It won’t be too long before it scabs over and we don’t have to cover it. There’s just this one spot that’s not so good. Let me clean it,” he says as he begins scrubbing my ankle with a cotton swab doused in Betadine. “Good. There’s no reason to cry.” He finishes scrubbing and cleaning the rest of my wound, and dresses it with foam and waterproof tape. Another good report. One more to go. You mean that same spot I’ve been worried about since the accident? The one I’ve been told was no big deal up to this point? “What’s wrong with it?” I ask. How did my toes get such deep wounds when I was wearing tennis shoes? What would it look like if I had worn my sandals like I originally wanted to that morning? I don’t think I wanna know. “OK, so what does that mean?” I ask, worry creeping into my voice. Tears sting my eyes. “Do you mean the spray they used on me in the ER?” Flashbacks to that day send a shiver through me. “With a needle?” I say, my voice quivering. Alone and worried, I think about whether or not I should do it. I know I should do it, but I hate needles, and I hate pain. And I know it’s going to hurt. A lot. Silent tears fall as I try to decide. Man, I wish my mom or dad was here. Heck, I wish anyone was here with me. They could hold my hand, reassure me, and tell me what to do. But they’re not. I have to do this alone. “Can I call someone?” I ask. Looking at the time, I realize I can’t call my family. It’s the middle of the night. I call the next best person, my best friend Shaggers. She immediately picks up. She already knows where I am, since I had been texting her updates and photos of my injuries. “Shannon, I’m scared,” I barely get out. She reassures me that while yes, the needle will hurt, I won’t feel a thing after that, and they’ll make it all better by removing the bad parts. Turning to Dr. Narong, through blurry eyes, I tell him I’ll do it. I crumble. Through sobs, I say, “Yes, I would like that.” This is why she’s my best friend. She’s always there for me through the tough times. She begins talking about some topics she might slice about tonight and asks me about my slice. I tell her an adorable story about what one of my kids did in school today. I might slice about that. We talk about a few other things…her sister’s new baby, Marlowe kicking her crib when she should be napping. The doctor and nurse prepare my foot. Dr. Narong tells me he’s ready to begin. Fear sets in, and I start to cry. Shaggers reassures me that I’m brave, I’m going to be okay. The needle goes in. AHHHHHHHHH!!! Screaming, crying, and thrashing about, the nurse holding my leg still. Shannon is still there, telling me the worst is over. Then, a few seconds later, a second needle in my other toe. AHHHHHHHHHHH!!! More screaming, more crying, and more thrashing about. What the hell? Why did I have two injections? Confused, Shannon asks me what happened. I tell her about the second needle…at least I think I do. “There’s no reason to cry,” Dr. Narong says. Like hell there isn’t! You’ve just injected me two times with anesthesia when I was told I would have one, and now you’re about to scrape my toe. Yeah, I have a bloody reason to cry! Dr. Narong then starts scraping my second toe. I can feel it, but not feel it, if you know what I mean. I’m still crying and struggling to breathe through my nose. Shannon’s still on the phone, talking to me, trying to distract me from the pain. I can’t really recall what she’s saying, but I appreciate that she’s there. Unexpectedly, I scream out in pain again, a guttural scream that comes from deep within me, but this time it’s not from an injection. It’s from the fact that my doctor is scraping the wound on my big toe without anesthesia. Shags wonders what’s happening. Dr. Narong tells me there’s no reason to cry. I tell Dr. Narong I don’t like him anymore. Petty, yes, but I’m not in my right mind at the moment. The next few minutes are a whirlwind of pain. My fourth toe gets the same treatment as my big toe. I question his wisdom. A few more scrapes, and he’s done. “All done. It already looks so much better. Have a look,” Dr. Narong cheerily says to me. “No really, look at it,” he pushes. Sitting up, I look down at my mangled toes, bleeding uncontrollably at the moment. Yeah, that’s heaps better. Still tearful, I thank Shannon for being there for me. And I apologize for screaming in her ear. She laughs, and says she only wishes she could have been here to hold my hand. Me, too, Shags, me, too. As I sit here, back home in my apartment, tears streaming down my face as I relive the experience, the pain coming on strong as the anesthesia wears off, I’m a mess of emotions. I’m in pain and disheartened that I have another setback, especially after such a positive day yesterday, and I’m grateful that I have a friend like Shannon who loves me through the hard stuff. I really don’t know what I’d do without her, and despite living in different countries for the past 5 years, we talk nearly every day and she knows me even better than I know myself. Shannon is my person. I love her. 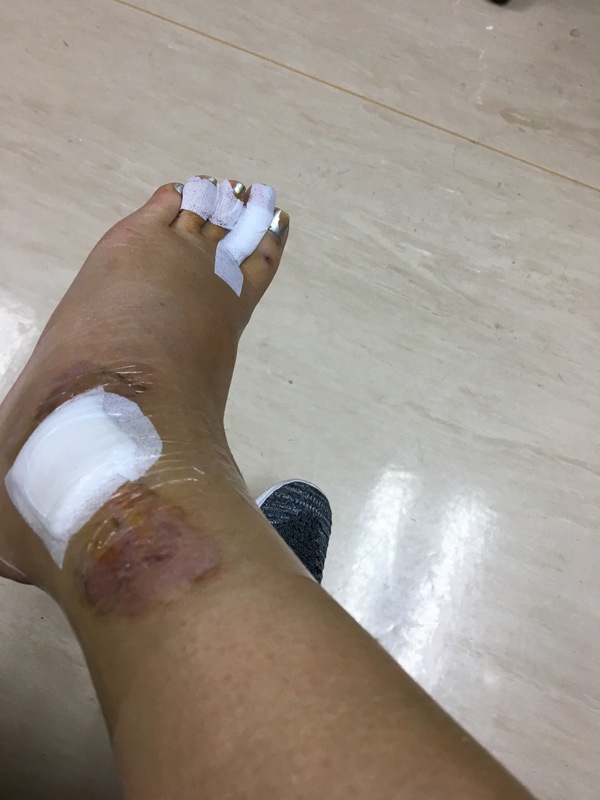 This entry was posted in Slice of Life and tagged #slice17, #slice2017, #sol17, accident, anesthesia, bangkok, besties, hospital, Shaggers, Slice of Life, Slice of Life Challenge, Thailand, toes on March 14, 2017 by aggiekesler. Ever since my accident over the weekend, I have received countless kind words and actions from friends and strangers. I cannot get over just how nice everyone has been, especially given the fact that I’ve been here less than two months! From the moment the crash happened, when several Good Samaritans came to my rescue, I have been surrounded by kindness! My friend and boss, Julie, went to incredible lengths to make sure I was taken care of. From taking me to the ER when the initial crash happened to setting me up in her house for the first day and night to waiting on me whenever I needed something to taking me to my follow-up appointment the next day to checking on me daily, she has gone out of her way to make sure I’m well taken care of. I cannot thank her enough for her generosity! My friend Lauren was the sweetest! On Saturday afternoon, she and Lincoln delivered a yummy Thai care package of a fresh coconut, mango sticky rice, and pomelo, all my favorite things here in Thailand! Later on that evening, she made me homemade tomato soup and grilled cheese, the ultimate in comfort food. She’s the best! After hearing about my accident, a colleague of mine, Dainty, brought over a bounty of treats including more mango sticky rice, bananas, bread and tomato salsa from the local Italian joint, and more pomelo. She barely even knows me, but went out of her way! My colleague and friend, Elissa, has been checking on me non-stop offering to bring me anything I needed. She sent over fresh fruit and a Starbucks treat via her husband Mitch on Sunday. She’s also been helping me out in the lesson planning department by supporting my sub while I’m laid up in bed. I am so blessed to have her as a friend! Josh, my friend, neighbor, and writing buddy, has also gone out of his way to help me, bringing me a jug of water, helping me tidy up my apartment, and hanging out with me. He’s coming over again today after work to keep me company and eat some dinner. I am so lucky to have met him during my first week, one rainy day at the hotel we were staying. He’s turned out to be a great friend! I’ve also received countless texts and emails from colleagues, friends, family, and my students’ parents offering their well wishes and offers to help. Whenever strangers see me struggling to get around on my crutches, they offer support, by way of holding doors, helping me with my bag, or just a simple smile. I am one lucky girl! I mean, getting into a motorbike accident is no fun, and in a foreign country, it’s definitely not ideal, but the people I’ve been surrounded by have made it a little more bearable! This entry was posted in Slice of Life and tagged #slice17, #slice2017, #sol17, accident, bangkok, kindness, mango sticky rice, pomelo, Slice of Life, Slice of Life Challenge, Thailand on March 7, 2017 by aggiekesler.